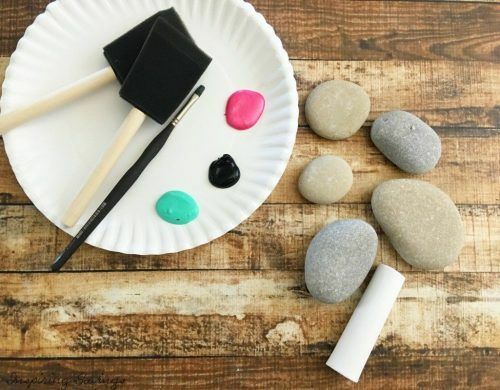 Here is a project where kids can wear their creative hats and paint their own DIY Painted Rock Tic Tac Toe Set. This activity is the perfect birthday party game. And let’s not forget that it really isn’t just for parties, you can make it for your next together or just some backyard fun. 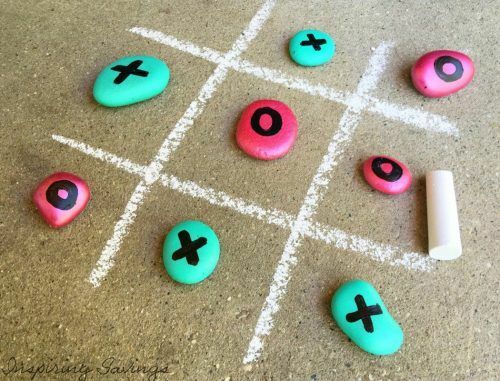 Tic Tac Toe is a great game that not only teaches sportsmanship but also strategy for young minds. Plus, one of my favorite parts is that it is very little cost involved. You may even have some of the supplies need to make in your home right now. This is a project I’ve had in mind since late December. I am so glad the weather is warming up and that I could get it going. My kids actually had a great time going on nature rock hunts to find their perfect round rocks. It kept them busy and we were enjoying our time together. See complete instructions below. Enjoy my friends and Happy Summertime to you. Step 1 – it is time to go on an outdoor adventure with your kids. Take them on your favorite hiking path or just for a nice walk. Grab a reusable bag or backpack to store your rocks. You are looking for about 10 smooth river rock. Bonus if you can find them all around the same size. Step 2 – Wash and dry your rocks if they are dirty. I would honestly wash them anyways, even if you didn’t find them to be dirty. The paint will stick better to a clean surface and not peel. 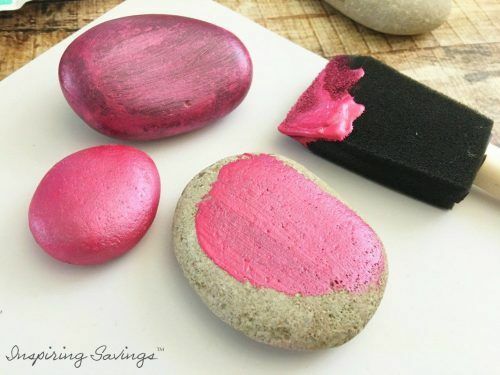 Step 3 – Using a foam brush, paint five of your rocks pink and let dry thoroughly. If you are outside on a hot day it will dry extremely fast. Don’t throw out that foam brush. Place in a place grocery bag and wrap up. We will be using it again to apply a second coat. Step 5 – Get out your previously saved foam brush and get ready to paint the second coat on your pink rocks. 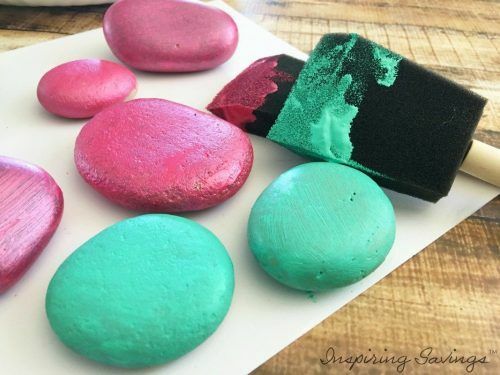 If after painting your pink rocks, move ahead and paint your teal rocks as well. 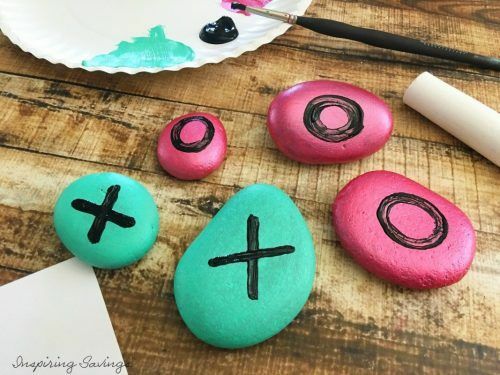 Step 7 – Once your rocks are dry, use your chalk to draw a tic tac toe board, then instead of drawing X’s and O’s, use your rocks! 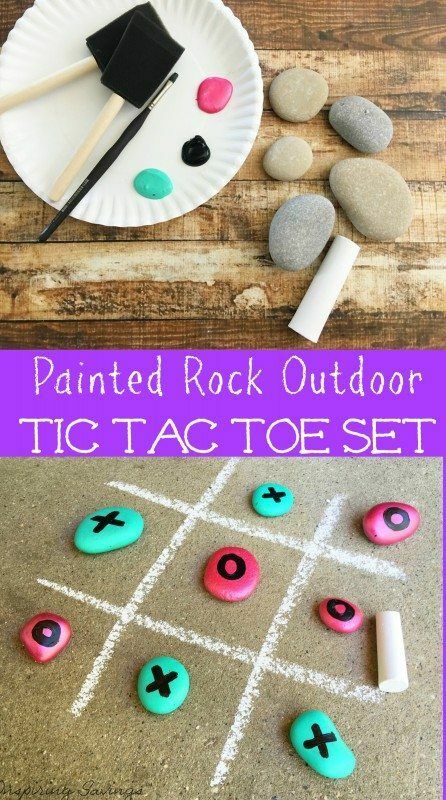 There you have it your DIY Painted Rock Tic Tac Toe Set it all ready to go. Let the games begin. If you have a fun little bag or even a shoe box you can store them in a safe place for your next game. Hey! The kids can even decorate that show box too. I can’t wait to get to use the game this summer, I love how fast the games go! How to Make Frugal Plant Holders Out of Old Pans!